Aluminum insulation jacketing is made out of .016" smooth aluminum that comes in 3 foot sections. The inside of the aluminum is coated with a poly moisture retarder that provides an excellent resistance to moisture and has excellent abrasion protection during installation. The Aluminum Jacketing is cut and rolled to fit each size of pipe insulation correctly. Use the chart to determine the size of the jacketing needed for the pipe insulation that you are trying to cover. 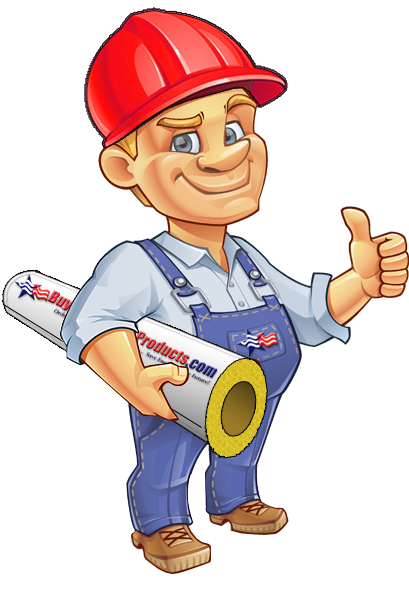 Aluminum insulation jacketing is good for mechanical abuse and for weatherizing exterior pipes. Aluminum jacketing can be installed with either drill screws or banding and seals (fab straps). 1. On horizontal piping, make sure the lap of the aluminum jacketing is pointing down to prevent any rain runoff from seeping in. 2. Fab Straps are usually specified to be placed every foot of piping making sure placement is close to the joints of two sections of jacketing. 3. On vertical piping, make sure the joints of the two sections overlap with the higher piece being placed over the lower piece. This will prevent rain runoff from seeping in. 4. On exterior pipes, all joints and laps should be caulked with aluminum colored silicone caulking. 5. An expansion joint should be installed on each run of pipe insulation. An expansion joint is a 6" to 8" overlap of two sections of aluminum jacketing that allows for expansion and contraction due to temperature changes. I used the aluminum jacketing for heat transfer over the PVC black and gray water drain pipes on my motorhome. I wanted to apply heat tape however, the heat tapes are not made to apply directly to PVC pipe unless it has water inside the pipe. Since they would not have water in the pipes after dumping the tanks I used the Jacketing to apply the heat tape. This will also be a better transfer of the heat than the PVC would have offered and it will not leave potential for damage of the PVC. The sleeves worked great however the elbows took a little manipulation to get them to fit correctly. This was due to the fact the insulation I used created more bulk at the elbows. If they were applied direct over the pipe it would have been a perfect fit. I used the fab straps to secure the the installation. I found it necessary to use a strap to pul the jackets and elbows snug. Once I got it snug I installed the fab straps which held everything securely in place. Click the button below to add the Aluminum Jacket for Pipe Insulation to your wish list.